Paul explains the believer's actual reality as he exposes what happens in believer's baptism. Baptism is, first of all, immersion into water by a willing subject, manifesting a willful change in the person's decision, will, and desire. 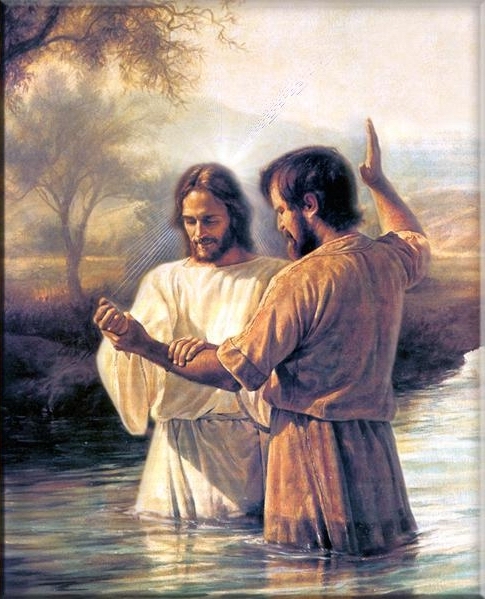 What I mean is that someone taking a bath or swimming in a pool is not undergoing baptism because they are not consciously showing a change in decision, will, or desire; on the contrary, the one who is baptized shows a willful change in decision, will, and desire, having been dominated and subdued by the Lord Jesus Christ. It might be helpful to list the three, physical and real parts of baptism at this point. First of all, one is buried into water, even as those who were baptized were "buried therefore into His death." The water really and actually covers me, even as Christ really and actually died; His heart stopped beating, His lungs stopped breathing, and His life was literally extinguished. Second of all, one is raised out of water, "just as Christ was raised from the dead." Christ's lifeless body was really laid in a tomb, His head literally wrapped up with cloth, and His head actually placed upon a stone table. Three days later, His body actually received life again and His blood ran anew and He actually walked on the real dirt of the physical ground, spoke real words out of His mouth, and even literally embraced His disciples. Lastly, after burial into water and resurrection out of water, one is really and actually prepared to "walk in newness of life." Just as Christ's physical body was changed after His death and resurrection, so that He could appear in the midst of His disciples through the walls and door of the house, and His literal body actually ascended before their very eyes into Heaven, so the believer's body is actually and really changed. He thinks differently, which is evidenced in his actual decisions, in his actual tears of remorse over sin, and in his real joy in the midst of real sufferings. So then, baptism is an important physical act in our bodies, which is not simply symbolic, but is real and, therefore, has real implications. (Likewise, the Lord's Supper is not merely symbolic, but it is real in the sense that we really and divinely commune with Christ at His Table.) This means of grace is found in the real substance of the things, not in mere symbols and signs. It is important to remember the real object of our faith. Even now, though I sit here apart from my wife, the ring on my finger is not a mere symbol: it really and actually shows my real and actual marriage to a real woman who really exists. Likewise, Jesus Christ, even now, really is in Heaven. He is not a mere spirit, un-existing and intangible; He is real and tangible! "Put your hands in My side!" He directed Thomas. "My Lord and my God!" declared Thomas in reply. "Blessed are you, Thomas, for you have seen and believed, and blessed are those who do not physically see Me, yet still believe in My reality." I believe in the Holy Spirit, the Holy Catholic Church, the communion of Saints, the forgiveness of sins, the resurrection of the body and life everlasting. Amen (The Apostle's Creed). What we do, therefore, in our bodies matters greatly ("shall we go on sinning so that grace may abound? By no means!" Romans 6:1-2). Do not continue sinning, but be changed! Your baptism is a physical reality of this. "The reality [the ordinances] are demonstrating is a spiritual truth" (author unknown).